The Cultural Landscape of Bali Province: the Subak System as a Manifestation of the Tri Hita Karana Philosophy comprises five sets of rice terraces and associated water temples. The Subak System refers to the thousand year old self-governing associations of farmers who share the use of irrigation water for their rice fields. Water from volcanic lakes is diverted through rivers and channels to end up in the rice terraces. As I already mentioned in my Yogya Palace review: I think Indonesia deserves a couple more WHS. Bali certainly can be one of them, and it might be in reach after a 2008 deferral. ICOMOS advised the Indonesians to "reconsider the choice of sites". They suggested including at least one site representing the subak system of water management. And a water temple like Tanah Lot would be nice too. I spent 4 days on Bali, basing myself in central Ubud, and liked it a lot. One day I went on a wonderful bike tour near the Batur volcano. They took us through a lot of little villages and past rice paddies. Each village is littered with temples, every family having its own, plus at least three for the general community. Hinduism is so alive here. It brought back my best memories from Nepal and India (Bali looks a lot more prosperous compared to those countries, by the way). I also visited the water temple Tanah Lot on my way back to the airport. This one is so close to Kuta that it is overrun with tourists. It has a pretty location on a rock just off the shore. The tide was low during my visit, so I could just walk across. The temple itself is closed to visitors however, you can only see a cave. I visited all the components of this WHS over a week in August 2018. Even though Bali has some very touristy spots and notorious tourist traps, it has its very own architecture, culture, traditions and is practically the only place in Indonesia were the majority practice Hinduism. Even though the inscription is centered on the subak system and landscape, this WHS has much more to offer than just another water management system. Personally, I was expecting something along the lines of UAE's aflaj or Madeira's levadas. What I visited in Bali can be roughly divided in 3 aspects. 1) Nature - Lake Batur, Mt Batur, 2) Beautiful man-made landscapes - Subak Landscape of Catur Angga Batukaru, and 3) Temples - Supreme Water Temple, Royal Water Temple and Pura Gunung Kawi Engravings. So to sum up all 3 aspects, the experience I had reminded me mostly of Kathmandu valley with multi-storied temples everywhere and a culture which is very much alive. I based myself in Ubud and organised a full day driver services to the different places I had researched before my arrival. Early starts are highly recommended to beat the crowds and to avoid getting stuck in traffic jams. As I usually skip lunch, visiting popular places such as Taman Ayun at around lunch time meant I had the place almost to myself. If you want to avoid being hassled just buy a cheap sarong and wear it before entering the temples or else be adamant that you're not willing to pay and you'll be given one for free (or a small donation) at the entrance. Another worthwhile tip is to print google maps and clearly highlight the long names of the temples - for example there are 2 pura ulan danu temples (Bratan and Batur, the latter being the inscribed one) in completely oppposite directions. Although I divided the locations in 3 aspects, you'll be able to experience a degree of each aspect in all inscribed locations. However, I'll describe what in my opinion were the highlights of each aspect during my visit. The first aspect, nature, was the least inspiring out of the three. Indonesia has great natural WHS and great non-inscribed natural sites, so I wouldn't suggest visiting Bali solely for this aspect. Even though the island is lush all year round (also thanks to the subak system), bird hunting and trapping is a very big problem all over Indonesia, so the only place worth visiting for birdwatching is the remote nature reserve on the north-western part of the island. Apart from that, in Bali you're more likely to see hordes of tourists, big coaches or vans struggling to pass through the narrow roads of Bali, and all sorts of tourist traps like instagram spots, Bali swings, etc. Elsewhere in Indonesia, huge never-ending nature reserves or national parks are rarely crowded if at all visited and have much more on offer. That said, Lake Batur makes for a very worthwhile stop for sunset (it is marketed as a lunch-time stopover point) before or after visiting the Supreme Water Temple of Pura Ulun Danu Batur. Here you have to have a sarong as you won't be able to borrow one. The supreme water temple has meru towers or pagoda-like shrines, intricate gates and very colourful and scary statues. Fog seems to be a frequent visitor here too because of the surrounding mountain landscape which adds to the atmosphere but may make it hard to view Lake Batur! The second aspect was the one I was looking forward to the most when visiting Bali. The scenic rice terraces of Bali with their year-round rice production help Indonesia's national economy as the third largest producer of rice in the world. The best place to experience everyday life in the rice terraces is the Subak Landscape of Catur Angga Batukaru, known as Jatiluweh rice terraces. The best time to visit here is in the late afternoon when all the locals feed the oxen in their little sheds, plough the terraces or harvest the rice. Even though a bit touristy, it is nothing like the tourist trap of Tegallalang (Ceking) Rice Terraces (where cattle sheds have been replaced by instagram spots or Bali swings) and is really quite large. It deserves at least half a day if you don't mind trekking a bit. The treks are clearly marked even though it's fun to get a bit lost, make friends with the locals and perhaps follow them through muddy short cuts up and down the rice terraces. I opted for the 3.8km long trek (blue line) and wasn't disappointed. If I were to revisit, I'd surely base myself here instead of Ubud. The rice terraces of the Subak Landscape of the Pekerisan Watershed were lovely too and also interesting to see the technical aspects of the deviation of water of the subak system. However, what impressed me most of the Pekerisan Watershed were the engraved shrines of Pura Gunung Kawi in Tampaksiring village. 5 shrines are located on the eastern side of the Pekerisan River (where an impressive Kecak dance is performed on special occasions - I had noted this place down from the documentary Baraka), 4 shrines are located on the western side and a 10th shrine is located at the Bukit Gundul hill with some ascetic caves. Here the different temples and shrines are very much still in use and a few of them are not open to women. The highlight of the Pekerisan Watershed subak landscape though is definitely Pura Tirta Empul where locals and tourists bathe in the holy spring water supposedly for ritual purification (even though E. coli contamination seems to have been an issue in 2017). This was by far the most crowded inscribed site. The highlight of the third aspect of this WHS was the iconic Royal Water Temple, Pura Taman Ayun, with its serene gardens, impressive gates and towering pagoda-like shrines (photo). All in all, I really enjoyed my visit in Bali and this WHS really was the highlight of my visit on the island. Outside all the different locations there were information boards and UNESCO inscription plaques displaying the different locations of this WHS. For those of you who want to visit more worthwhile temples (not inscribed) in Bali, I suggest Pura Besakih and Pura Ulun Danu Bratan. For those of you who want to stay away from the crowds (as much as possible in an already crowded island), avoid Pura Lempuyang (instagram spot - gate of heaven with volcano background) and Tanah Lot. 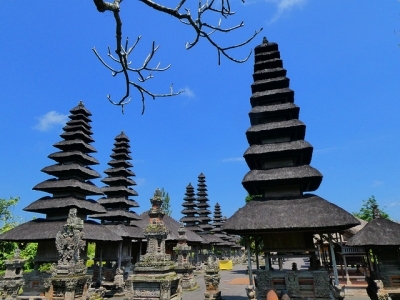 Despite having been to Indonesia for quite several times and already visited 3 World Heritage Sites of this country, Bali which is the most famous and popular tourist attraction and possibly the “first” and “must visit” place to visit for every itineraries was logically omitted from my travel plans for many occasions. The reason was I was afraid that one day I would have a chance to attend seminar on this island, so I decided to skip this island and use my times to explore somewhere else. Unfortunately Bali already lost its status of Southeast Asian premier seminar destination to Singapore and Kuala Lumpur, as a result, my expectation to have seminar in Bali has become uncertain. During my recent business trip to Singapore, I added few extra days to visit Bali and its World Heritage Site. During my three days in Bali, I hired a car with driver as recommended by my friend in Jakarta, a very convenient choice for such a short visit and a driver also acted as a guide who could shield me from those infamous scam and hassle in many temples. From all sites that I have been, 3 sites are recognized by UNESCO, Taman Ayun Temple, Subak Landscape of Pekerisan and Lake Batur. The royal temple of Taman Ayun is famous as the grandest survival of once powerful Mengwi Dynasty’s architectural style. The large complex was surrounded by moat with elaborate palatial main gate that illustrated the glory of the builders. The highlight of the temple was the main sanctum with many impressive and elegant multi-tiered pagodas. The craftsmanship of brick decorations on these pagodas’ platforms were stunning in every details, and the view of pagodas row of this temple was really one of the most iconic spot of Bali. To be honest I was not sure I truly understood the concept of Subak landscape. For me the concept of landscape of water distribution with religious sites and rice fields looks typical around South and Southeast Asia, the rice terraces of Bali were much inferior from the sites in Philippines, Vietnam or China, although the elements of Balinese’s unique culture made the landscape to be unique. 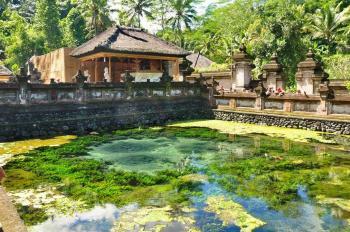 For all sites in the Pekerisan, Pura Tirta Empul Temple, in my opinion, was possibly the most stunning. This temple was totally different from Taman Ayun Temple in terms of design and architecture. The whole complex was built around the sacred spring water well with many shines dedicated to local gods and hundreds of pilgrims who came for bathing in the sacred pool. Watching those pilgrims, and many tourists, did bathing rituals by dedicatedly praying to god and offered flowers to the springs were heartwarming experience and really put Bali to be a special place on earth. The craftsmanship of smaller shrines around the complex were equally stunning with many gold painted details with countless images of Hindu gods. 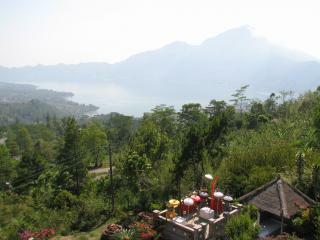 The last element of Balinese World Heritage Site I saw was Lake Batur, a scenic sacred lake. I felt that visiting Lake Batur was a bit of tourist trap because of every tours had to go there for buffet lunch in one of many restaurants in the area. At least the view was quite pretty and its holy status did remind me the famous five lakes of Mount Fuji in Japan that I hardly accepted their sacredness, but for Lake Batur I felt I could appreciate its religious value more than Japanese site maybe because from Balinese culture on landscape experiences made me wanted to believe! I really enjoyed my time in Bali, its World Heritage Sites were really good and in terms of architectural and landscape design were really outstanding and unique. Even though Balinese culture is really special like its own universe, I felt that there were more sites in Bali that deservedly to be listed by UNESCO, so the question why other stunning temples such as Besakih temple, Tanah Lot temple or Gua Gajah cave were not part of the nomination. Exclude those sites made the current list to be questionable on its real universal outstanding value but again I don’t think I can make any judgement or comparison, only local Balinese could tell which sites are more special than the others. I recently spent two days touring the Subak areas. On the first day I visited the Pura Taman Ayun, a very neat compound which can only be seen from across a hedge. It features 11 roofed pagodas and a canal full of lotus blossoms. From there I continued to Mount Butukaru and the Jatiluwah rice terraces, a large area of man-made terracing. Another day I took the steep road that climbes up to the rim of the caldera overlooking the volcanic cone of Mount Batur and its namesake lake. Here I changed into Balinese costume to allow me to visit the Pura Ulun Danu Batur. This large complex is clearly a site of religious significance to the Balinese. During the descent I stopped at Tegalalang for lunch and to see more rice terraces. Visiting these sacred sites in Bali is in marked contrast to the usual Balinese tourist haunts of Nusa Dua, Kuta and Ubud. 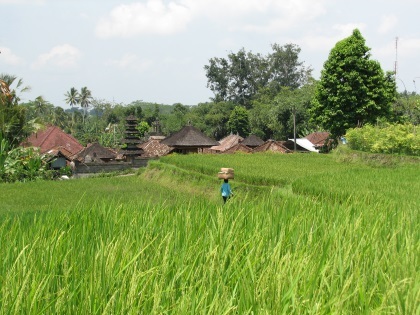 Subak (irrigation) system in Bali is not a mere irrigation system. The water that irrigates the paddy fields comes from the water temple surrounded by the paddy fields. While water holds a spiritual meaning for Balinesse, to purify, cleansing, to become a better being.... hence the whole Subak system has the same spiritual meaning as a whole. The long awaited inscription for Bali into the WHS has finaly come. This place is arguably one of the most wonderful places ever existed. Where you could feel different while in different part of the island... and one couldnt get enough of Bali for sure..
2.0: Luke LOU Craig Harder Tony H.
As "Cultural Landscape of Bali Province"